Let's Encrpyt is a free, automated and open certificate authority by the Internet Security Research Group (ISRG)! This will be a long tutorial, so I'll break it into two parts and this post will cover obtaining your certificate. Installing your certificate will be out later on! I hope this is a helpful post. I'm going to run you through how to install Let's Encrypt, obtain and configure SSL/TLS (on Nginx). I'll also go through how to set up a cronjob that will automatically renew your certificate, they only last 90 days! Before starting, this tutorial was created for Ubuntu v14.04, with a non-root user that has sudo privileges. You also need an A record that points your domain to your webserver's ip address, as well as having both example.com and www.example.com as domain names. Finally you need GitHub installed to clone the repository. 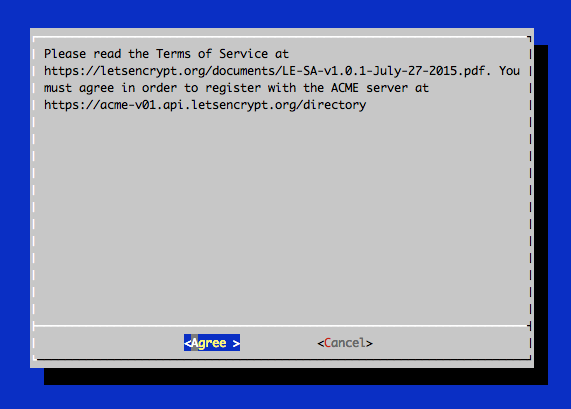 You should now have a copy of Let's Encrypt in the /opt/letsencrypt directory. We're going to use the Webroot plugin to obtain our SSL certificate, you can use various other plugins (eg. Apache) but they will only obtain the certificate. You will still need to manually install them. The Webroot plugin works by placing a file in the /.well-known directory within your document root, which will then be opened through your webserver by Let's Encrypt for validation. Depending on your set up you may need to explicitly allow access to the directory. To make sure that the directory is accessible to Let's Encrypt, we'll make a quick edit to our Nginx setup. The below command uses the default location, you may need to amend it. You will also want to look up your document root, by searching for the root directive. This path is required for the Webroot plugin. The default location for this is /usr/share/nginx/html. Now you can save and exit, then reload nginx to get your updated config in action. Now we want to use Webroot to request our SSL certificate. We are specifying our domain names with -d, you can use one certificate for multiple domains so include all the domains you want! Take note of your email, path and expiry date. They can be found in the first and second bullet points. A common error to get here is Failed to connect to host for DVSNI challenge, this means that you may need to reconfigure your webserver's firewall to allow TCP traffic on port 80 & 443. It's very important that you know where these certificate files are kept because you will need to reference them in your webserver configuration! The files are placed in a subdirectory: /etc/letsencrypt/archive. However Let's Encrypt creates symbolic links to the most recent certificate files in the /etc/letsencrypt/live/example.com directory. Because these links will always point to the most recent certificate files, this is the path that you should use to refer to your certificate files. The output from this command should be the above list of your certificate files. This will generate a 2048-bit group. It may take a few minutes but when it's done you will have a DH group file in the location specified. The next step is configuring your SSL/TSL, this post will be out sometime this week! Reveal.js - The best presentations!